The more poor designs and writing skills hurt my head. Seriously, who puts 3000+ words into a single paragraph to describe a designer’s responsibilities? Half of the time you read the responsibilities and you, being the web educated person you are, know that the person writing the job description has absolutely no clue what they are talking about. Do professionals use Dreamweaver? Do they even teach it in school? I personally haven’t touched it since DW4, which was before Adobe pulled a Highlander move on Macromedia and absorbed its powers. Anyway, on to some other news. I decided to create another website that says simply what I am and what I can offer for you. Ready? It’s http://ocalawebdesigner.com. I figured it couldn’t be any more simple than that, Ocala Web Designer. Now I am off to create the design for that, as well as, some signs and business cards for my brother and I. Back to the college question. 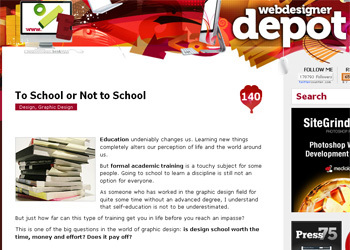 The author talks about the pros and cons of going to school for design. The pros are basically that you get a degree that says you know what you are doing, however, the cons outweigh that. No matter what, you have to constantly self-educate yourself while in and out of school. The design field changes constantly, there are new tricks, software updates and techniques released nearly daily. Colleges are not able to keep their classes up to date with this constant change. He stated his friend, an Art Director for a firm, only looks at an applicants portfolio when hiring, not their schooling. This makes complete sense. I can tell you I went to a technical college and learned to work on cars, but you wouldn’t believe me if I couldn’t tell you the type of engine, oil and gas were in my car, right? I believe this just fortifies my decision to self-educate. With unlimited resources online and plenty of books available, as well, I think I will be just fine. It has been running through my head that I should go to college, and it has also been recommended to me by a few people. Today it ran through my head that I should take a run up to the local college that offers web design and talk to someone there about going to school. I skimmed through the courses, and then through some of the financial aid information. They talked about some of their scholarships and how one can get up to $10,000 a year. That got me thinking, exactly how much does it cost to go to this school, and exactly how much is it going to help? I talked to my friend, who is currently going to a major design school in south Florida, and she told me it’s not all about the education, it’s also about building your portfolio. Now, if you are reading this, you know I am pretty decent with my design skills. I may not be the head of a large or famous design firm, but I do have my share of skills and knowledge. None of that was school taught, either, there are fifteen or so books on my bookshelf that are textbooks to me, with myself being the teacher. So, why exactly would I pay thousands of dollars to educate myself on certain topics, when I can just spend a few hundred dollars on some more books that can provide me with the same education? I use the term, “same,” loosely, too. It may be the same topics, but I think I can get a better grasp, and probably deeper understanding of certain things from dedicated books and the internet. Then, it would just be my portfolio. That is in the works as I type, one site is nearing completion with a few others in the brainstorming stage. With that, I believe I may just be set to at least begin freelancing, because landing a design job here in Ocala will take some time. No, it didn’t take me that long to complete it, I had other things on my plate I was dealing with. Thank you very much. Something you must always do, especially in this economy, if you want to stay afloat. I’ve been moving forward, unfortunately it just hasn’t been at a fast pace.